There is no question that security attacks targeting your organization will continue to grow and evolve. The question is, how can you respond to malware and other risks without unnecessarily constraining your workforce? How can you get beyond the fear and anxiety that leads to excessive prohibition, prevention, blocking, and excluding – so that you can use security technology to both protect and empower people? The answer is with a multi-layered defense – one that uses advanced security technologies and sophisticated operational practices in combination to cover the full spectrum of threat vectors. 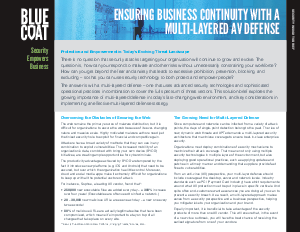 This solution brief explores the growing importance of multi-layered defense in today’s fast-changing web environment, and key considerations in implementing an effective multi-layered defense strategy.